Welcome to another World of Ink Blog Hop….. Opening Lines: Quincy was a little red horse. His coat was the colour of a new penny. His mane and tail were long and shiny. Synopsis: Quincy tries to overcome his fears about “surprises waiting for horses out on the trail” by going on his first trail ride. Quincy’s main concern is the wild animals he might meet but the real challenge turns out to be another horse. Buck, the horse he hopes will be his trail buddy and guide him, turns out to be a bully who is dangerous! Quincy learns some important things about dealing with a bully. Why I like this: At 40 pages this beautifully illustrated book is slightly longer than the norm for picture books, but Michelle’s rich oil colours are worth it. I was once a horse mad teenager that would do anything for a book like this. The story gives a very realistic view of horses, how they react with one another and along with illustration details and scenery makes this popular for the older readers. The theme of overcoming fears, courage, and having strength of character and dealing with bullies is cleverly weaved in. A popular book, great gift idea and a wonderful resource for schools. 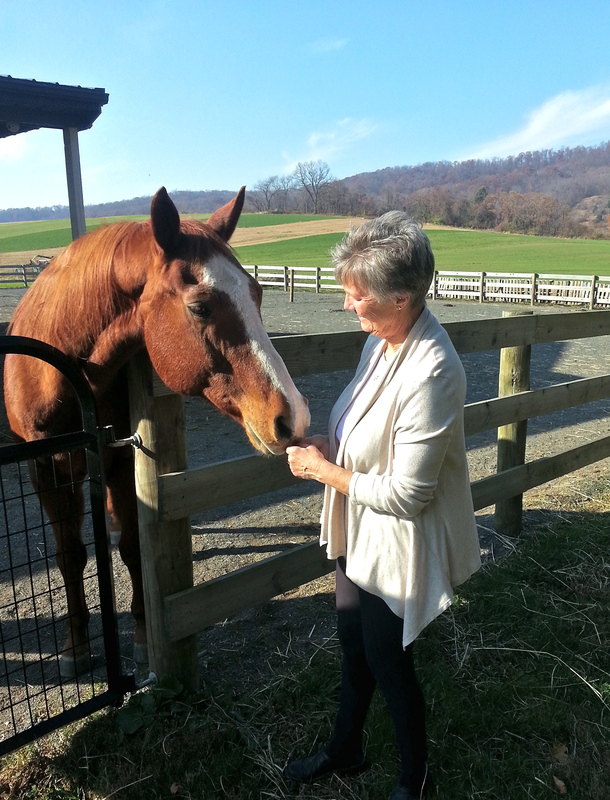 The real Quincy whose early experiences inspired the Quincy the Horse series, is an American quarter horse who came to live with Camille when he was 7 years old. He was an active trail horse until he contracted EPM. After several years of rehabilitation, he was able to return to light trail riding and became a mainstay therapy horse, providing equine assisted mental health services to teens and adults. Now 24 years old, he is still working as a member of the equine therapy team at Pathfinder Farm in Reading, PA.
Camille Matthews and Michelle Black met in Farmington, New Mexico where Camille was a clinical social worker providing psychotherapy and equine therapy and Michelle was a horse trainer and artist. Camille told Michelle about the Quincy the Horse children’s books she was creating about the real life of one of her horses. Michelle offered to illustrate the series. Both are equestrians who between them have done just about everything with horses but they agree that the creation of the Quincy the Horse Books for kids K-4th grade is their favorite project. 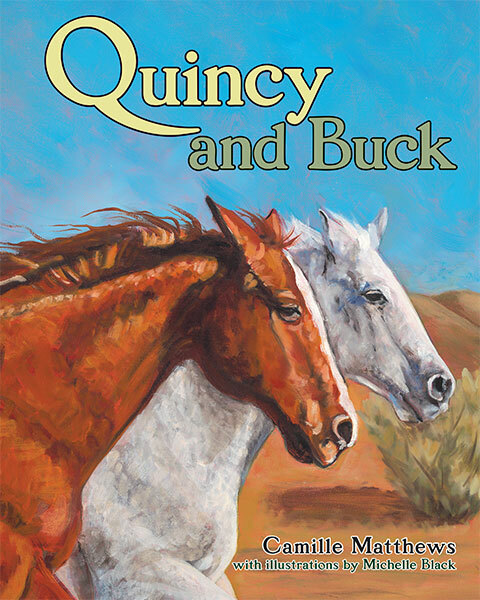 They have just completed the third book of The Quincy the Horse series, QUINCY AND BUCK. This entry was posted in Literature, Picture Book Review and tagged Camillie Matthews, Children's Picture book, Michelle Black, Picture book, Virginia Grenier, VS Grenier, World of Ink Tour. Bookmark the permalink. I love horse stories and movies. My daughter rode (English) large Saddelbred horses for about 8 years and she won her first ribbons on a horse named Bucky! Now my great granddaughter is riding western quarter horses and loves it. She would love this book. Nice choice. Always dreamt of riding as a child, but was terrified when I went riding with a group at Mesa Verde and a snake startled my dad’s horse, throwing him. The guide slapped the rear of my horse and I went flying back to the stables at a fast gallop barely holding on. Although I love horses, I have a respect for them and maintain my distance. Yep, I love horse stories too, Penny. It has lovely illustrations right through the book, Erik. Glad you liked it, the message is universal and many kids would relate to it. Thanks, Erik. This looks like a lovely book. We like horse stories at our house!